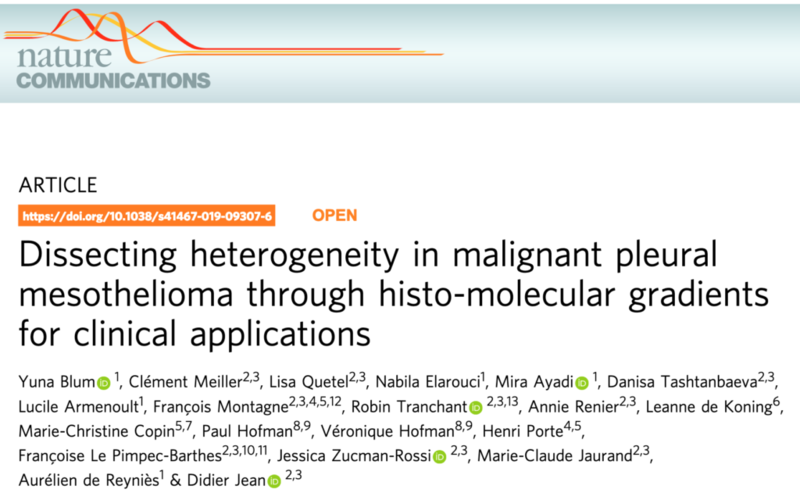 Yuna Blum, from Ligue National Contre le Cancer and Didier Jean group used a deconvolution approach and show that molecular gradients shed new light on the intra-tumor heterogeneity of malignant mesothelioma. Malignant pleural mesothelioma (MPM) is recognized as heterogeneous based both onhistology and molecular profiling. Histology addresses inter-tumor and intra-tumor hetero-geneity in MPM and describes three major types: epithelioid, sarcomatoid and biphasic, acombination of the former two types. Molecular profiling studies have not addressed intra-tumor heterogeneity in MPM to date. Here, we use a deconvolution approach and show thatmolecular gradients shed new light on the intra-tumor heterogeneity of MPM, leading to areconsideration of MPM molecular classifications. We show that each tumor can bedecomposed as a combination of epithelioid-like and sarcomatoid-like components whoseproportions are highly associated with the prognosis. Moreover, we show that this moresubtle way of characterizing MPM heterogeneity provides a better understanding of theunderlying oncogenic pathways and the related epigenetic regulation and immune andstromal contexts. We discuss the implications of thesefindings for guiding therapeuticstrategies, particularly immunotherapies and targeted therapies.